Memories. – Life Is Such A Sweet Insanity. 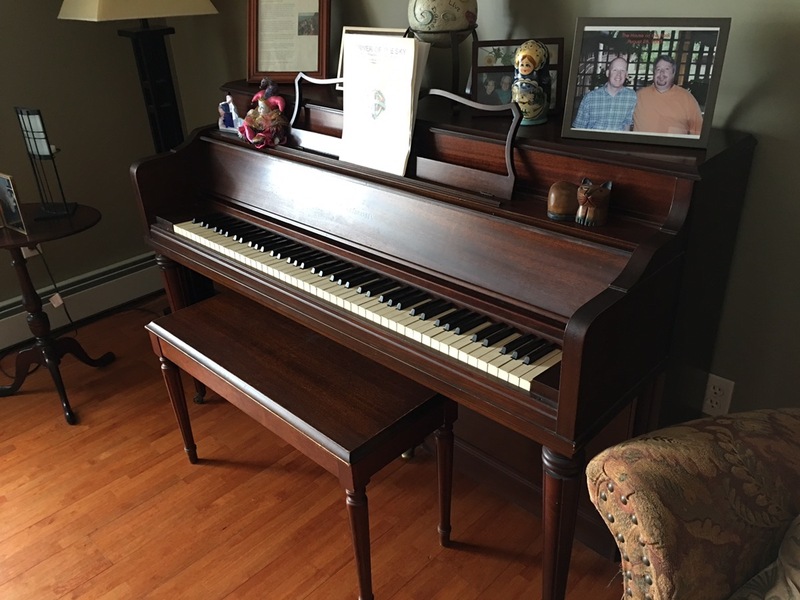 I think it’s been around 10 years since my grandmother’s piano made its way to our home. As a kid I always loved it when she played the piano and would let me (and/or my cousins) play the piano from time to time. Once when my sister and I were staying at my grandparents’ house while my mom and dad were on vacation, I was playing the piano rather loudly. My grandfather came over, put his hands on the piano and said in his typical voice, “Do you know what the word ‘refrain’ means?” He then closed the lid over the keys and that was that for the rest of the evening. Beyond my love for music and my amateurish abilities at being able to play piano, one of the things I love about having the piano is that it still smells as it did when I was a kid. I don’t know if the piano smells like the 1959 mid-century house it used to live in or if the house smelled like the piano, but the scent lingers on and it makes me smile from time to time. The piano is a 1949 Gulbransen, so I’m assuming it was in the original farm house that my grandfather tore down to build the mid-century modern house he had custom designed and then built in 1958-1959. There was a special spot designed for the piano in the living room. As the estate was being settled after his passing, I couldn’t bring myself to go into the house with the piano (and other things) missing. I didn’t want to put dents in my memories of that house and that home. My sister and I were the lucky grandchildren that lived next door; I would visit Grandma Wing every day after elementary school and watch “Bewitched” and “I Dream of Jeannie” after she watched her stories while baking or cooking or doing other housework. She sometimes saved the ironing so she could iron while watching TV with me. I tell Earl that if we had the money we would build a mid-century style home based on those custom plans, with a couple of modifications (vault the living room ceiling, make the dining room bigger). To this day I am absolutely in love with the design of that house. But in the meanwhile, I’ll make music and revel in the memories.